…an unforgettable experience and a must for all oyster lovers. Taste oysters at their freshest while exploring their origins at the actual farm production area. You’ll be shown how oysters and mussels are grown and have oysters shucked and served with a glass of bubbly while at sea. 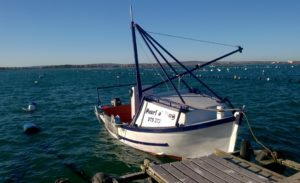 The boat departs from Pepper Bay harbour and travels a short distance to the farm in the Inner bay of Saldanha Bay, with the whole boat trip and exploration of the farm operations taking approximately one hour. Other sea life such as seals, marine birds and occasionally dolphins and penguins may be sighted depending on the season and a bit of luck. 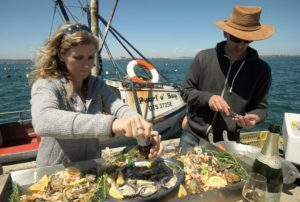 The trip includes 6 freshly shucked oysters and a glass of bubbly served out at sea. There is also an option of purchasing additional oysters at farm-gate prices to either enjoy there-and-then, or have packaged for home. This is an open decked working vessel and a small degree of agility is required to board and disembark from the vessel at the jetty. Tours need to be arranged in advance and are weather dependant. Copyright © 2019 C-Sideoysters. All rights reserved.